Chateau / Country House2000 sq. ft.
Light, spacious and private guest wing to a beautiful former rectory set in 7 acres of tranquil grounds with stunning views. 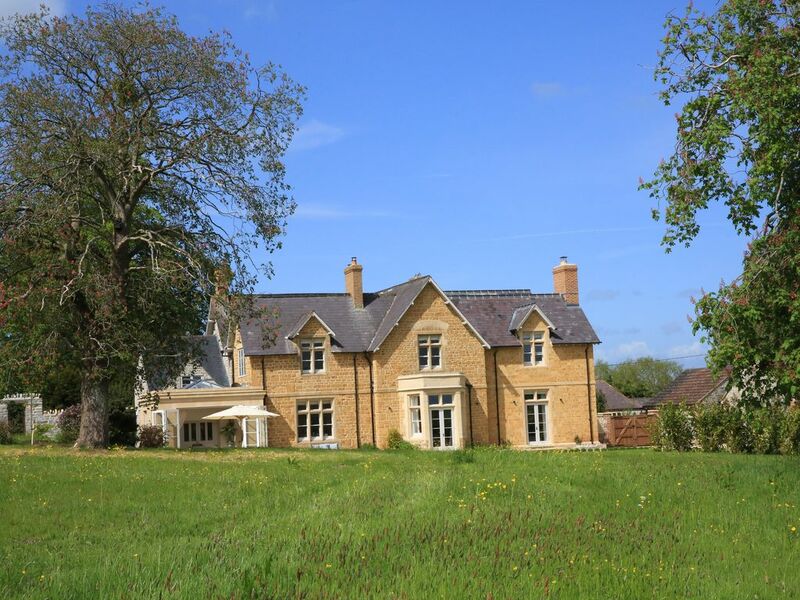 Near to the popular Somerset towns of Bruton and Castle Cary. Excellent access to Castle Cary train station (5 miles/ 90 mins from London Paddington) and A303 (3 miles). Perfectly located to explore local attractions such as Hauser & Wirth, Bath and West showground, Haynes Motor Museum, Glastonbury and the Somerset levels, Mendip Hills, Sherborne & the Dorset Coast beyond. On the upper floor here are two en suite luxurious guest rooms adjacent to each other. This area is divided from the main house by a heavy oak sliding door that will remain shut during your stay ensuring total privacy. Elegant stairs lead down to the media room with its surround sound cinema and the breakfast room (with sink, fridge and all provisions you will need for a continental breakfast). The host will set the table for breakfast so that you can enjoy it at your leisure. Downstairs is also divided from the main house and is serviced by its own private entrance with easy parking in the courtyard outside and excellent access to the entrance where you can easily unload your luggage. Guests always comment on what a happy and light feel the space has! French doors lead out to the garden from the media room where you can take in the dramatic southern views across the beautiful vale of Camelot towards Cadbury Castle (suggested as the possible location of King Arthur’s legendary castle). There is a terrace space with an eating area in the charming courtyard between the house and the garage block. There is no light pollution in North Barrow which means that the property is great for stargazers. A swimming pool is available at owners’ discretion that is heated during summer months. There is a wildlife pond in the south Eastern part of the property that guests can walk to and a cider orchard that has been recently planted. There are various walks that originate from the village and the local roads are very popular with cyclists as it is on the south Somerset cycle route. There is a footpath that leads away from the far field (not visible) towards South Barrow. The village itself is a very small hamlet without shops or pubs. There are excellent pubs nearby, including The Red Lion, Babcary (5 mins), The Bull Inn, Hardway (15 mins), The Queens Arms, Corton Denham (15 mins), and The White Hart, Somerton (20 mins). Bruton and Castle Cary are less than 10 minutes away. Bruton has a number of excellent restaurants including Roth Bar and Grill and At The Chapel. Hauser & Wirth gallery in Bruton is only 10 minutes away. There is excellent walking including Cadbury castle and wildlife spotting in Somerset levels. The charming Dorset town of Sherborne and its Abbey is 20 minutes away. Dorchester is 45 minutes away and the Jurassic coast is an hour’s drive. Stourhead (20 mins) is easily accessed along the A303 and has great walking around its beautiful lakes and through its Italianate gardens. Haynes motor museum is 5 minutes away. Babington house is 30 minutes away, as is Glastonbury. The space is highly suited to families or friends looking to escape to a beautiful part of the West Country. I’m a wildlife filmmaker living in beautiful Somerset with my wife Laura and two happy children. I once made a wildlife film for Disney about flamingos that was shown in cinemas around the world. I love to travel, although haven't felt such itchy feet since moving to this wild part of England. I love to walk on the Somerset Levels and photograph the starling murmurations. I am a keen surfer and have been known to get up before dawn and drive to the coasts of Devon and Cornwall for a surf and then return in time for lunch at home. Being so close to the South West coasts is another great thing about living here! I once came across an epitaph on a Cumbrian gravestone. It read: "The wonders of the world The beauty and the power The shapes of things Their colours, lights and shades. These I saw. Look ye whilst life lasts." This felt like good advice and has been something of a maxim for me on my own life journey! Stunning property in the country side, both modern and clean. My husband and I stayed in the guest wing of this amazing property for two nights and found it perfect for us. It is a little of the beaten track and a great place for peace and quiet. The bedrooms are a fabulous size and beautifully decorated, both with large and very modern en-suite bathrooms. The large living room was super comfortable and a great place to relax. The kitchen is lovely and bright. Leander was a great host and made us feel most welcome and very easy to contact if we had needed to. He gave us a great recommendation for dinner at The Queens Arms at Corton Denham which was fabulous. All in all a great place to stay and would highly recommend and we are looking forward to a return visit. Thank you Leander for making us feel very welcome and being a great host. Beautiful place!Immaculate, spacious and very welcoming. Definitely would recommend to anyone and wished we could have stayed longer.